Nissan’s new Mixim concept shows what a future electric-powered city car might look and act like, the Japanese automaker said as it previewed its concept prior to a Frankfurt auto show introduction. 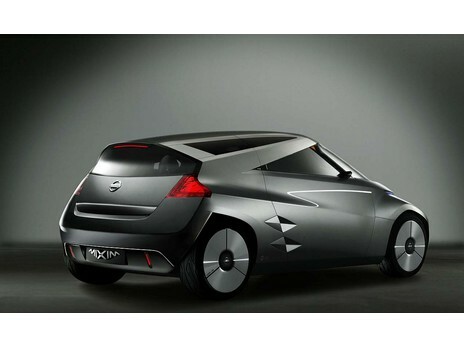 The Mixim is powered by a “Super Motor” electric powertrain, which Nissan promises will give the concept “unusually rapid performance” and a “usefully extended range.” Since one motor powers the front wheels and one, the rears, the Mixim is all-wheel driven. The use of lithium-ion batteries will likely be the hot topic at the Nissan press conference in Frankfurt. Both GM and Toyota are experimenting with the high-capacity batteries, but neither has approved them for production - and reports have indicated Toyota would not delay its next-generation Prius hybrid in expectation of using lithium-ion batteries in it. In terms of its packaging and shape, Nissan says the coupe shape applied to the Mixim will make it appealing to a young driver and two passengers, each sitting on either side of the driver seat. A fourth seat is tucked in beneath the hatchback. From the outside, the Mixim is said to resemble the visor of a crash helmet, with its staggered roofline and choppy rear end. Diamond shapes are found all around the exterior, from the air intakes to the rear door shape to the LED driving lights. Inside, the steering wheel and controls are patterned after video games. The Mixim rides on a 99.6-inch wheelbase, is 145.7 inches long and 70.9 inches wide, and 55.1 inches high. More compact than Nissan’s Micra, it weighs about 2100 pounds.